Catholicism: A Prisonhouse Of Religion! 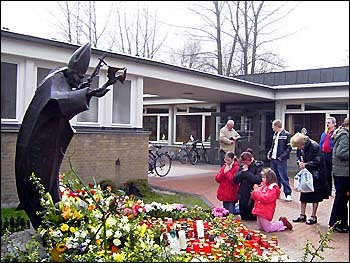 Photo to Right: Deceived Catholics, adults and children alike, sinfully commit idolatry by bowing and praying to a graven image of Pope John Paul II. Exodus 20:4-5 strictly forbids even bowing before images of any likeness of anything, which is the 2nd Commandment. What a prisonhouse of religion! I was watching the Catholic EWTN (Eternal Word Television Network) today and wanted to throw a brick through the TV set. I'd never heard so many lies in my life. Today's program was titled, “The Grace Of A Happy Death.” The show featured Fr. Andrew Apostoli (a member and co-founder of the Community of the Franciscan Friars of the Renewal, CFR), and author of the book titled, “Treasure of Fatima.” Fatima is a big hoax of the Vatican, not prophesied anywhere in the Scriptures. Photo to Right: This poor child is being taught idolatry from infancy, as are hundreds-of-millions of Catholic children. Where in the Word of God are we directed to pray “specific prayers, practices, and devotions to aid in achieving the most pleasant, happy death”? No amount of prayers, practices, nor devotions can help us obtain eternal life. The Catholic Church is of the Devil. God doesn't require any self-righteous works from us to be saved (Romans 4:3-5). In sharp contrast, we are saved solely by Christ's righteousness, which is imputed to every believer at the time of salvation when they believe the Gospel (Romans 4:6; 2nd Corinthians 5:21). Oh how foolish are the people who allow themselves to remain victims of Catholicism. I plead with you to forsake the false religion of Catholicism (whether Roman or Russian Orthodox), and come to Christ alone by faith to be forgiven and saved eternally. On the EWTN show today, they were talking about litany prayers (i.e., a prayer consisting of a series of invocations by the priest with responses from the congregation), Purgatory, keeping of the Sacraments, praying for the dead, living in a state of grace, devotion to the Rosary, et cetera; but they never once mentioned believing the Gospel (Christ's death on the cross, burial and bodily resurrection three days later) to be saved. All I ever hear Catholics talking about is religion, religion and more religion; BUT, they never talk about being born-again by FAITH ALONE in Jesus Christ. The reason is because Catholics have PERVERTED the simple gospel of Christ by adding all sorts of prays, practices, and devotions to it. Catholics teach sacramental salvation, that is, that salvation is obtain through keeping the seven sacraments of the Catholic church. Of course, the Bible calls Catholic teachings the doctrines of devils (1st Timothy 4:1-3). Notice that 1st Timothy 4:3 specifically mentions the heresies of forbidding to marry (celibacy for priests) and forbidding to eat red meat (Catholics worship Dagon the fish god by only eating fish on Fridays). These are doctrines of devils, not taught in the holy Scriptures. Roman Catholics DON'T follow the Bible. I recently visited a magnificent local Catholic church. The outside of the building is exquisitely designed, with a pure brilliant white exterior, and superb lighting shining from the well-manicured landscape at night and I wanted to see what it was like inside. I was passing by and noticed a gathering inside, so I decided to sit in on a Rosary. I couldn't find a Bible nor a song book anywhere, because they memorized everything. Catholics diligently recite dead chants like a herd of zombies, and it feels like you're amongst the living dead from Hell beneath. I felt like I was in a whited coffin filled with rotting corpses. The Spirit of God is NOT present in any Catholic Church. A Catholic woman once heard me say that and became upset, but that's ok, she needed to hear the truth... the Holy Spirit of God is NOT present in the Catholic church!!! The inside of the building was as beautiful as the outside, sparing no expense. The auditorium is shaped like a big cross, with enough seating for I'd say at least a thousand people. The interior is huge. The ceilings are very high, with golden chandeliers and beautiful decor. Like KFC, but instead of chicken, Catholics know how to do religion right. Unfortunately, it's just that, religion. There is no truth in the Catholic church because it's been suppressed deliberately from the people. Salvation is NOT found in any religion; but rather, in a Person—the Lord Jesus Christ Who died, was buried and raised up for our sins. If you add anything to faith, then you have corrupted the simplicity that is in Christ (2nd Corinthians 11:3). Adam tried to sew fig leaves together to hide his and Eve's sins, but God rejected Adam's fig-leaf religion. God also rejected Cain's grain offerings, which represented man's very best self-righteous attempts to please God in the flesh. In sharp contrast, God accepted Abel's blood sacrifice (which pictured Abel's faith in the coming Messiah, the Lamb of God, Who taketh away the sins of the world [John 1:29]). The Bible couldn't be more clear; YET, Catholics continue going about to establish their own righteousness (Romans 10:3,4). Salvation is by faith alone in Jesus Christ, without works! The “works” which the Apostle James spoke of, refer to us being justified in man's eyes, not Gods. James clearly says in James 2:18, “Shew ME, and ... shew THEE.” 1st Samuel 16:7 teaches that only God can see our heart; BUT, man cannot. With men we can only be justified by our works, because they cannot see our true intentions in our heart; but with God we are justified by faith, because He does see our heart to the fullest extent (Proverbs 24:12; Hebrews 4:12). Hebrews 4:13, “Neither is there any creature that is not manifest in his sight: but all things are naked and opened unto the eyes of him with whom we have to do.” Nothing is hidden from God, which is why He can and will judge all men righteously in eternity, without the need for juries nor trial. Hence, we are justified by works with man, who cannot see our heart; BUT, we are justified by faith with God, who can see out heart. Romans 4:5 clearly supports this doctrine, “But to him that worketh not, but believeth on him that justifieth the ungodly, his faith is counted for righteousness.” We mustn't add, diminish, nor corrupt the Scriptures from what they plainly teach. Men are saved by believing the gospel (Mark 1:15), that is, that Christ DIED, was BURIED and RESURRECTED three days later according to the Scriptures (1st Corinthians 15:1-4). Purgatory Is A Big Lie! 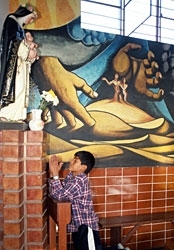 Photo to Right: Luis, 10, prays in idolatry before a statue of Mary in Santa Rosa church in Peru. “Rosary for the Holy Souls of Purgatory.” Tassone is a false prophet who teaches damnable heresies. Regarding the preceding statement from the Catholic.com website, it is true that the words “Trinity” and “incarnate” are not found in the Bible, as neither is the word purgatory. However, unlike the doctrines of the Godhead (Trinity) and the deity of Jesus (which are taught elsewhere in the Bible), the manmade tradition of Purgatory is not and was fabricated by Gregory The Great in 593 AD. So the doctrines of the Trinity and the incarnation of Christ are taught in the Bible, but purgatory is not. Again, the word “Trinity” is not found in the Bible; but, the word “Godhead” certainly is (Acts 17:29; Romans 1:20; Colossians 2:9). It is also true that the word “incarnation” is not in the Bible; but, the deity of Christ is clearly taught (1st Timothy 3:16... “God was manifest in the flesh”). “Incarnation” means that the Word became flesh. God the Father, God the Holy Spirit and God the Son all existed in the flesh, the man, of Jesus Christ (John 1:1-3,10,14; Colossians 2:9; Isaiah 9:6). Purgatory is NOT taught in the Bible. There is NOTHING in the Bible which teaches Purgatory. The above argument from Catholic.com concerning purgatory is lame. We have solid Biblical evidence of the doctrines of Christ's deity (that He is God almighty) and also of the doctrine of the Godhead. There's NOTHING in the Bible which even remotely suggests a temporary place for the dead who are waiting to be prayed out by loved one's still alive here on earth. The false teaching of purgatory is an evil invention of the Roman Catholic religion, which has been used for centuries as an effective means to exploit people of their money, who donate to the church in hopes of purchasing a loved one out of purgatory. Once a person dies, their eternal fate is sealed forever and cannot be altered by anyone, not even God, because His Word cannot be broken as He has so PROMISED (John 10:35, “...the scripture cannot be broken”). Mark 13:31, “Heaven and earth shall pass away: but my words shall not pass away.” Jesus taught that a man must be born-again or else he cannot enter into the kingdom of God. God would be a liar if He allowed anyone to slip through who wasn't saved. If you DIE IN YOUR SINS (John 8:24) without Jesus Christ, then you are going to the Lake of Fire forever. Purgatory was first introduced in 593 AD. 1st Peter 3:19 has nothing to do with Purgatory. Most theologians agree that 1st Peter 3:19,20 refers to the Spirit of Christ which preached through Noah to the unsaved people of Noah's time. Those lost souls were imprisoned to sin and unbelief, just as most people are today (Galatians 5:1; 2nd Peter 2:20; 1st John 5:19). There is a common belief among Christians scholars, such as Oliver B. Greene and Jack T. Chick, that an Old Testament place existed called "Paradise." Some respectable scholars, such as Dr. John R. Rice deny this claim. I personally believe there was an Old Testament Paradise, which was part of Hades. Hades (Hell) was composed of two compartments as we read in Luke 16:26 (Torment and Paradise). You can learn much more about Hell here. We should respect the opinions of all these great men, for the issue of paradise is not a fundamental doctrine of the faith. If you believe that Old Testament saints went straight to Heaven, amen, and I wouldn't argue the point. However, NOT one of the men I just mentioned ever taught that Paradise was "Purgatory" (i.e., a temporary condition of torment or suffering). Paradise was simply a place for Old Testament saints to go until Jesus completed His work of permanent redemption. Hebrews 9:12, “Neither by the blood of goats and calves, but by his own blood he entered in once into the holy place, having obtained eternal redemption for us.” Jesus' physical blood once and for all made the sacrifice for the sins of men. Jesus didn't atone for our sins. The word “atonement” is an Old Testament word that means to cover, temporarily, which is all that the blood of lambs and goats could do. Ah, but Jesus' blood permanently washes away the sinner's sins (and God only saves confessed sinners). It is clear from 2nd Corinthians 12:4 that Paradise is now in Heaven. My point is that whether or not there was a place called "Paradise" in the Old Testament, it is not anything like the damnable teachings of the Catholic religion concerning Purgatory. The entire concept of Purgatory is that some sinners receive a second chance. The Catholic church recognizes two different types of sins: venial and moral. Venial sins are things like lust and envy; but moral sins are things like murder and adultery according to the Vatican. The Catholic teaching is that if a Catholic dies with unconfessed venial sins, then they go to Purgatory and can be prayed and bought into Heaven only via donations to the church from loved ones or friends. If the unconfessed sins are moral, then they're in Hell and without hope. Furthermore, by confessed I mean unbiblical confession in a booth to a Catholic priest. That is their teaching. At least once every 6-months Catholics are requires to go to confessional. I call it the telephone booth. One of the saddest and most tragic things I've ever heard was popular EWTN priest John Corapi claiming that he absolved his father's sins just before he died. No man has the God-given power to forgive sin! 1st Timothy 2:5 proclaims that there is only one Mediator between God and men—the man Christ Jesus!!! Albeit, the Bible doesn't teach different types of sins; but rather, all sin is wicked and punishable by eternal hellfire and damnation (James 2:10). Romans 6:23 teaches that the wages of all sin is death. All it took was one bite from the forbidden piece of fruit to eject Adam and Eve from the Garden of Eden, and bring the curse of sin and death upon the human race. Albeit, I believe that they went to Hades (which was compartmentalized into two separate places: Torment and Paradise, which the Bible does seem to indicate in Luke 16:19-31. The rich man was in torment, but Lazarus was in Abraham's Bosom, and there was a great gulf fixed between them, showing that these two places were side-by-side, co-existing in locality. If the story in Luke 16:19-31 is taken literally (and it certainly ought to be since the Lord didn't call it a parable), then the Bible supports the teaching of Hades being compartmentalized into the two distinct places of paradise and torment. Literal names were used in this Biblical account of the rich man and Lazarus, instead of saying that “a certain man” went into a “far country,” as Jesus often spoke in His parables. Jesus was specific here. Mormons and Jehovah's Witness claim that Luke 16:19-31 is only a figurative parable, and not a real situation that happened. They teach this lie because both false religions DENY a literal Hell that burns with fire and brimstone. I've witnessed to different Jehovah's Witnesses, who differed in doctrinal opinion; but basically, JW's believe that everyone will be given a second chance one day and those who still don't comply with God's ways (JW doctrine that is) will be annihilated (cease to exist). So statistically you'd be much better off becoming a Biblical Christian—because if the JW's are correct you'll receive a second chance one day; but if the Bible's correct you won't, you'll go straight to Hell forever. There are NO second chances in the grave my friend. You have the choice NOW, and it's totally up to you where you'll spend eternity. If you want to be saved and go to Heaven, then all you have to do is believe on the gospel of the Lord Jesus Christ. Jesus died, was buried and rose up from the dead. The Lord paid for your sins and mine with His precious blood. If you'll receive the gospel as full-payment for your sins, then you'll be saved immediately, irrevocably and eternally. Salvation is a new birth, a second, spiritual birth, that can never be undone once it has happened. Most religious people who profess to be Christians only have the philosophy of Christianity, which they've adopted into their thinking, but they've never truly been born-again by the Spirit of God (Romans 8:9). The reason is because most professing Christians have believed a false plan of salvation that includes water baptism, keeping sacraments, ceasing from sinful bad habits, committing one's life to God, following Jesus, saying a sinner's prayer, forsaking the world, joining a denomination, endeavoring to live for God, working to be sanctified, changing one's lifestyle, et cetera. Every one of the things I've just mentioned are based in self-righteousness if you rely upon them to save you. The believer's salvation is based solely upon Christ's blood sacrifice for our sins. We are saved by HIS RIGHTEOUSNESS, that is, Christ's imputed righteousness (Romans 4:6). James 2:23, “And the scripture was fulfilled which saith, Abraham believed God, and it was imputed unto him for righteousness: and he was called the Friend of God.” What a precious Scripture!!! God is so awesome! What a lie! Purgatory is a place where Roman Catholics think those who have died in a state of grace undergo limited torment to expiate their sins. Clearly, this is works salvation, where the individual is required to pay for their own sins by being tormented. Photo to Right: A statue of Saint Anthony, which is sinfully worshipped by many Catholics. "All forms of divination are to be rejected: recourse to Satan or demons, conjuring up the dead or other practices falsely supposed to ’unveil’ the future. Consulting horoscopes, astrology, palm reading, interpretation of omens and lots, the phenomenon of clairvoyance, and recourse to mediums all conceal a desire for power over time, history, and, in the last analysis, other human beings, as well as a wish to conciliate hidden powers. They contradict the honor, respect, and loving fear that we owe to God alone. Hypocritically, the Catholic religion is one of the world's biggest seller of CHARMS! Their own Catechism condemns "wearing charms." Carefully notice what the Catholic Catechism states above ... "All forms of divination are to be rejected: recourse to Satan or demons, conjuring up the dead..." Well isn't that interesting! Sister Emmanuel claims to be "...able to see and talk to the souls in Purgatory." Clearly, this is necromancy. 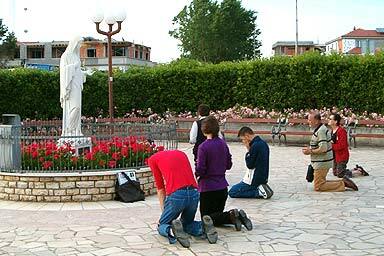 Photo to right: People in Medjugorje praying to the Queen of Heaven. Also, the Catholic practice of praying to statues and images of dead saints is necromancy. Some Catholics are uncomfortable with their phraseology, and so insist that they pray "with" the saints, not "to" them. However, if one is communicating, or attempting to seek out or pursue the dead in any way, they are by very definition, practicing Necromancy. This is the pagan religious practice which is customary in nearly all pagan religions. Jesus Christ is the ONE MEDIATOR between God and men (1st Timothy 2:5), and He doesn't need or want any help from dead saints. To teach otherwise is to distort the plain teaching of the Scriptures. Not even one mention is made in the Word of God about praying to, or for, the dead. ALL prayers are to be directed to God alone. Jesus taught us to pray, “Our Father which art in Heaven...”; NOT “our mother,” not “our brother,” not “our sister”; but God the Father alone. Those who die without Christ are doomed forever the moment they leave this world. Praying for the dead is useless and unscriptural. Jesus clearly said, “Ye must be born again” (John 3:3). The Roman Catholic church is a cesspool of homosexual perverts and pedophiles. Pedophilia and homosexuality are inseparable (as many as 50% of all Catholic priests are Sodomites). Catholicism is a lie of the devil, a prison-house of religion. If I didn't sincerely care about people, then I wouldn't take the time to WARN you. The Catholic religion is all a bunch of Satanic lies based upon traditions and ridiculous manipulations of the Word of God. I plead with you as a friend, obey the Bible by turning to the Lord Jesus Christ in faith and forsaking the Mother of Harlots. The Great Whore of the Catholic Church will take you to hell with them if you're foolish enough to follow them. Don't do it. Salvation is NOT found in a religion, but in a Person--the Lord Jesus Christ! You need Christianity friend, NOT churchianity. One of the most popular Catholic priests in America is John Anthony Corapi (born 1947). Mr. Corapi claims that he was converted by a priest who absolved his sins at a Confessional in 1984. The saddest thing about John Corapi's conversion testimony is when he mentions his father coming to him for salvation after 50-years. I intend no disrespect to Mr. Corapi nor his deceased father, God forbid; but if his earthly father thought he was going to Heaven because his son forgave his sins, then he is not in Heaven according to the Bible (and neither is John Corapi saved). Mr. Corapi states that he absolved his father's sins at a Confessional. It simply does not work that way friend. Only God can forgive sin, and the Bible is very clear that forgiveness is only promised on the basis of Christ's blood sacrifice; not by the whim of an earthly priest nor some sinister minister. In the Old Testament, the tabernacle high priest killed a lamb, a lamb without spot nor blemish (picturing the sinless Lamb of God) and brought the blood of the lamb into the holy of holies. The priest then sprinkled that blood on the mercy seat to atone for the sins of the people (Leviticus 16:15). This represents Christ's blood that He applied to the mercy seat in the heavenly Holy Place (Hebrews 9:12, 22-24). Thank God, the blood has been applied! This is the basis of true salvation by which our sins are eternally forgiven. With that in mind, it becomes so obvious just how ridiculous it is for Catholic priests to claim the power to forgive sins. It is the precious blood of Jesus Christ that washes away our sins (1st John 1:7), in response to one's faith in Christ; and not the arrogant words of some priest who says, “I absolve you of your sins.” What arrogance! In John Corapi's conversion testimony the priest says, “I” absolve your sins. No priest can absolve anyone's sins, not even his own. Woe unto Catholics! You cannot show me even one Scripture where someone was saved by confessing their sins to a priest nor Apostle. Mr. Corapi has some very unbiblical beliefs that are a road to Hell. Corapi thinks that chanting the Rosary is the Gospel, and he claims salvation comes from saying “Bless me Father for I have sinned.” Well, you certainly are sinning by going to a priest to be forgiven; but no priest can bless nor forgive you. The blessing sought is forgiveness through the priest. That is 100% false religion! Only God has the power to forgive sins!!! It is only by the imputed righteousness of Jesus Christ that men are declared righteous in God's eyes (Romans 4:5-6). This happens by faith alone in Christ Jesus to forgive one's sins (Ephesians 2:8-9). 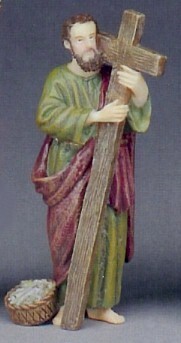 Only Jesus has the nail-scared hands and feet; so only in Jesus' name can anyone be forgiven (Acts 4:10-12). May I say, Biblically, you can confess your sins to a Catholic priest until your face turns blue and your tongue falls off, but it won't help you get your sins forgiven in the least. Catholic priests are extremely arrogant and revel in their self-proclaimed power to forgive people's sins. Catholic priests love teaching the masses that they alone have such POWER. It is a form of aphrodisiac for priests. Catholic priests relish in their claim that they alone can forgive people's sins, which is the height of arrogance, self-exaltation, and pompous stiff-necked pride. They set themselves up in the place of God; and in so doing lead Catholics to commit idolatry every time they step into the confessional booth, confessing their sins to a priest who is only a sinful man himself. Galatians 6:3, “For if a man think himself to be something, when he is nothing, he deceiveth himself.” Catholic priests are nothing, and they can do nothing. God has NEVER given anyone, neither His Apostles, power to forgive men's sins. The Bible plainly tells us how to obtain the forgiveness of sins in Acts 10:43, “To him give all the prophets witness, that through his name whosoever believeth in him shall receive remission of sins.” There you have it... WHOSOEVER BELIEVETH IN HIM SHALL RECEIVE REMISSION OF SINS! That is the only way to have one's sins forgiven. Accepting Different Religions | It Pains Me | Hail Mary! Hail Satan! | Catholic Blasphemy! Vain Repetition | Catholic Idols | Homosexual Priests | Who Can Forgive Sin? Vatican to Officially Allow Gay Priests | Priests and Boy Scouts | One Mediator! Inside the Catholic Catechism | Pope John Paul II - Burning in Hell | The Catholic Church is a Big Hoax! The Pope, the Devil, and the Masonic Lodge | Sacred Immaculate Heart of Satan! A Woman Rides the Beast | Praying to Mary | Roman Catholicism Exposed! | To Whom Do Catholics Pray? Peter's Tomb Recently Discovered in Jerusalem—NOT Rome!